I’m in a bit of a knitting and crochet slump at the moment – I just seem to have lost enthusiasm over the past couple of weeks. I’m not sure if it’s because I’ve decided not to buy any new yarn for the next few months (we’re currently saving up to buy a camper van for this summer) or if it’s because I’ve been (trying) to knit to (failed!) deadlines. I suspect it’s a bit of both. 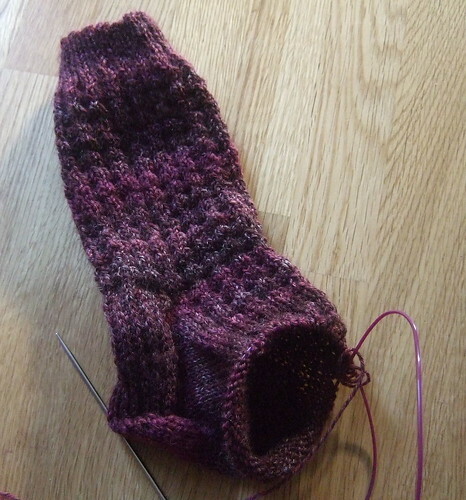 It blueberry waffle socks are turning out nicely……..
…..but they will not be finished in time for mother’s day (tomorrow), and I didn’t get the alpaca wrap finished in time for my sister’s birthday, but both my mother and sister say that they are very happy to be getting them, and don’t mind waiting. I still feel that I need to complete them before working on anything else. I think that, for me, most of the enjoyment in crochet and knitting comes from planning a new project, buying the yarn etc, and I often loose interest fairly quickly once the project is underway, which is why I usually have so may projects on the go at any one time. Maybe I just need to take a break for a while, or start something else from yarn in my stash. Any comments? Well, are you an ENFP by chance? (Meyer-Briggs scale) I’m an ENFP and I can have the same issue. Actually, I think I have it less with crochet than everything else I do in my life. Slumps are good! You’ll see, this means a BIG idea is about to sprout. I for one can’t wait! Tell me about it! I knit and knit and crochet like mad but am far too impatient – so it goes wrong, so I frog it, then I get bored, abandon it and start on something else. My other half says frustratedly ‘but we never see an END PRODUCT’ – and I have to agree with him. It’s defo all about the planning and buying with me. I was thinking only today I MUST FINISH SOMETHING and then that will inspire me to move forward: maybe the child’s cream boxy jacket, or the daisy cot blanket, or the ‘Lark Rise’ shawl, or the Manos shawl, or the….. I go through phases, too. Do you think designing new patterns is more exciting? Maybe that is the way to go.